Grosvenor Casinos belongs to one of the biggest land based casino operators in the UK. It is in fact a brand of The Rank Group PLC, a company quoted on the London stock exchange and whose headquarters are located in Maidenhead. The Rank Group also holds other brands such as Mecca Bingo, Rank Interactive and Enracha (for the Spanish market). Grosvenor Casino is an operator like no other, it is truly unique for it does not only exist on the web. It also has 54 casino premises in the UK, the first one having opened its doors back in 1970. They also own one in Belgium where one may try their luck at various slot machines, at roulette, play poker, blackjack or baccarat or even dine or have a drink in a festive atmosphere. The Grosvenor Casinos physical buildings, which are currently in the hands of Alan Morgan (Managing Director), has obtained impressive results in the past years: 7.7 million of visitors every year and a revenue of £373.0m according to the figures published in June 2018. In 2007, the brand launched its online casino, grosvenorcasinos.com, which now also offers a high-quality mobile version to its players for it is now available as an IOS and Android app. We shall evaluate this online casino in this Grosvenor Casino review, for it is a reference in Great Britain. Many British players naturally turn towards this internationally renowned brand in order to play online. As a matter of fact, in 2017 the online casino Grosvenor reported £47.5m in annual revenue. 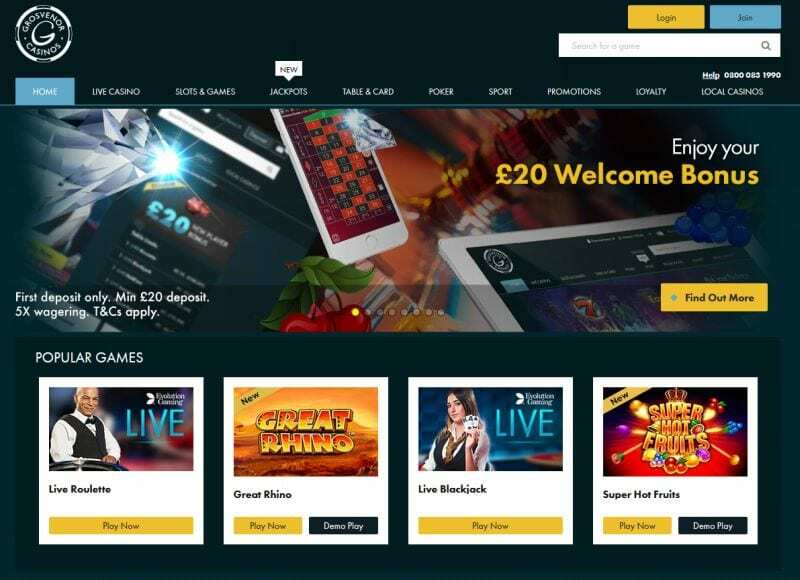 At the present time, Grosvenor Casino online offers players who sign up and make a first deposit of at least £20 on its website a welcome bonus of £20. This offer is accompanied by conditions which are much more flexible than on the majority of other casino platforms which makes it really interesting. Indeed, it only subject to a wagering of 5 (compared to 35 or even over 40 amongst other operators). To benefit from the Grosvenor online welcome bonus, your first fund deposit must be superior or equal to £20. Please note that when you credit your account for the first time you may choose to accept or refuse this Welcome Bonus, and in order to do so you must select either “Yes Please” to receive it or “No thanks” to refuse it. It’s as simple as that ! The sum of this bonus and the winnings derived therefrom must be replayed 5 times within 30 days from issuance of the bonus before being withdrawn in exchange for cash money. The minimum deposit amount is also set at £5. There are no withdrawal limits, however please note that withdrawals exceeding £15,000 per day undertaken using a credit card will require you to contact the customer service since Mastercard and Visa cards may be subject to certain limits. As required by the UK Gambling Commission, Grosvenor applies a responsible gaming policy on its online casino. It is for this reason that every player is invited to collect information regarding the daily, weekly and monthly maximum deposit limits for gambling must remain a pleasure! Once those thresholds have been reached, it is not possible to further credit one’s account. Your Customer Zone allows you to access at any moment your Cash Balance which indicates the sum you currently hold to play with real money and the All Games Bonus Balance in which you may visualize the sum of your bonuses which are therefore subject to a wagering. This online casino accepts payments through Paypal which is one of its big pluses. This alternative payment solution is very popular amongst players for it is secured and instant, yet unfortunately made available by only a handful of operators. Do note that winnings are payed via the payment methods previously used to deposit funds. The only exception to this statement however concerns some Mastercards which may not receive funds. In this case, withdrawals may be carried out by bank transfer. When they are performed by bank transfer, a processing fee of £5 applies. 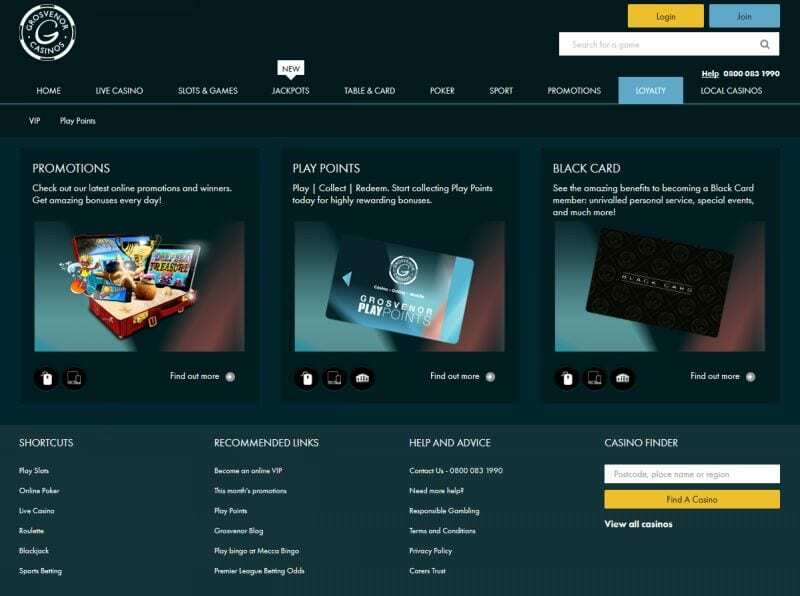 Retrieving the winnings obtained by playing on Grosvenor Casino is extremely simple since all one has to do is log into their account and click on the “Withdrawal” tab. From then on, the player must enter the sum he wishes to withdraw, the minimum withdrawal amount being £5. A bill or a bank statement no older than 3 months. These documents may be sent by email or by post. In the first case, it is possible to simply snap pictures of them with one’s smartphone. The payment terms of Grosvenor Casino lie somewhere between 1 and 5 days. The payments are made the same day from Monday to Friday. The casino then does not process payment requests between Thursday and Sunday, thus they will only be considered the following Monday. The full universe of casino is represented on Grosvenor: Grosvenor casino slots, live casino, roulette, blackjack… It is even possible to join a poker game or bet on football or tennis games for example thanks to the sports betting branch. Grosvenor betting site is a great sportbook choice ! For the casino part, the casino uses the UK-based platform Bebe Gaming, while for its sports betting services it makes use of the sports betting platform Kambi which is registered in Malta. 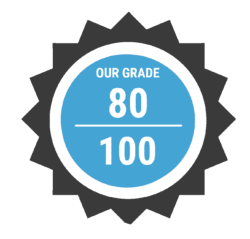 Both these providers possess a UKGC license and focus on a responsive user experience. With more than 350 slots powered by the biggest slot providers on the market (Playtech, Bally, Barcrest, WMS, Amaya, Ash, MX Gaming, Blueprint, Endemol, Cosy, Probability, WMG, Freemantle, Dynamite Idea, Electracade, Game Account, Gaming Portals, Mazooma, Mkodo, NextGen Gaming, Red Tiger, Netent, Pragmatic, Yggdrasil, SG, Gameiom), this online casino benefits from a broad range of games. The Jackpot section enables direct access to those video slots which offer a chance at winning Jackpots, like the fantastic Mega Moolah. Grosvenor Casinos has a license issued by the Gambling Commission which allows it to offer its games and services in the UK. In addition, it is regulated by The Alderney Gambling Control Commission which was created in May 2000 in order to control and regulate online gambling companies. The AGCC also allows regulated iGaming operators to advertise their offerings on British territory. To ensure the appropriate safety and security of payments, the online casino is based on a 3D Secure system. The latter consists of a password which players will be asked to provide before any credit card deposit. The aim of this is obviously to prevent fraud and deposits carried out with stolen credit cards. Loyalty program: The Play Points card enables you to accumulate points every time you play, even if you are not a VIP player since this card is made available to all. One you have acquired it, the sums played on the online casino, the mobile casino and the real casinos will allow you to accumulate Play Points which can be exchanged against bonuses or gifts you may choose in the store. (100 Play Points = £1). VIP program: The operator promises a preferential treatment to its VIP players thanks to the Grosvenor Black Card. It is reserved for the best players and enables them to accumulate points when they play whether it is online or in land-based casinos which they can then exchange for money. This VIP card also grants them access to some exclusive offers as well as a personal account manager. Gambling on the website of a large company like that of The Rank Group is always reassuring! 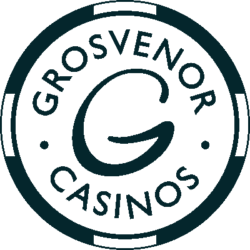 Thanks to the Grosvenor Casinos apps available on Google Play and on the Apple App Store, the operator offers its players a mobile casino which is 100% responsive for an enhanced gaming experience from a smartphone. WHAT WE WOULD LOVE TO GET ON GROSVENOR CASINOS ? Grosvenor is a mega brand offering a very large selection of casino games and verticals unfortunately Bingo is missing. Even if we are not Bingo players, we are sure that Grosvenor Bingo would be a great success !